I really enjoyed visiting Art Genève (1-4 February) as well as discovering the city’s art scene last week. It was my first visit to the fair or I should say the “salon” as Thomas Hug, the fair director, likes to present it, and it has a lot to offer to art lovers. Established 7 years ago and gathering 86 modern and contemporary galleries from 15 countries, Art Genève teamed up for its seventh edition with Patrick Perrin, founder of the Pavilion of Arts + Design (PAD), to launch PAD Genève. Perrin launched PAD in the Tuileries gardens in Paris 21 years ago and at Berkeley Square, London, 11 years ago. Quality is certainly present with galleries like Gallery Continua, Nathalie Obadia, Daniel Templon, Galerie Mitterrand, and Blain|Southern participating. First-time exhibitors include Perrotin, Giò Marconi, Art : Concept and Galerie 1900-2000, and Pace (which just announced a Geneva location, opening in March). My favourite booth was the presentation from In situ Fabienne Leclerc Gallery of Mark Dion’s theatrical installation wallpaper, Wunderkammers/ life-sized cabinets of curiosity from Voltaire to Poe. The artist becomes an archaeologist. He invites us to a journey through his drawings, sculptures and installations inspired by natural histories. I can’t wait to see his exhibition at Whitechapel next week. Indoor sculpture park from the estate of Swiss artist Max Bill. In addition to the commercial galleries, Art Genève included private collections, presentations like the Swiss publisher Michael Ringier’s collection, an entrancing indoor sculpture park from the estate of Swiss artist Max Bill. Also present was and a tree installation by Arte Povera artist Giuseppe Penone from the Freymond’s collection. The day after the opening I decided to discover the local art scene. I started with the stunning private collection of Eric and Caroline Freymond. 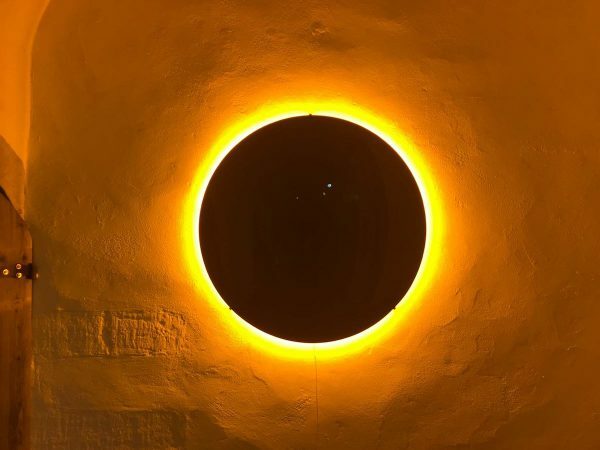 Followed by their space dedicated to contemporary art called Espace Muraille which is hosting an exhibition by Olafur Eliasson. It is undoubtedly one of my favourite exhibitions in Geneva. It attests of Eliasson’s research on time, perception, space, movement and the relativity of reality. The artist experiments with light, colours, even water (the water sculptures are fascinating). He offers us 16 intimate works which encompass the subsance of his research as a visual artist inspired by science. I then visited “Les Bains”, the district where the Museums and Galleries are. MAMCO, contemporary art museum of Geneva, is located in a former factory. It is the largest contemporary Museum in Switzerland. Lionel Bovier and Julien Fronsacq have curated an art historical exhibition on “Narrative Art” 1970-80, the conceptual art in California. Next to the Museum, at Gallerie Laurence Bernard, I enjoyed the works of the French artist Bertrand Planes: artist and (computer) programmer, he is both a visual artist and a tech-inventor. His drawings/ graphs where he measures his mood over a year are a witty artistic attempt to quantify and rationalised human emotions. Down the road at Galerie Xippas, I was mesmerised by Michael Scott exhibition “Op Art on acid” where the American artist geometric shapes and repetitive pattern create aesthetic optical effects. One my last day I headed up to Ariana Museum dedicated to ceramics and glass to see François Ruegg, the contemporary Swiss ceramist artist who did a residency in the famous porcelain city in China Jingdezhen. His exhibition “Statuts, statues” questioned with humour the complex relationship of the pedestal to the work of art.